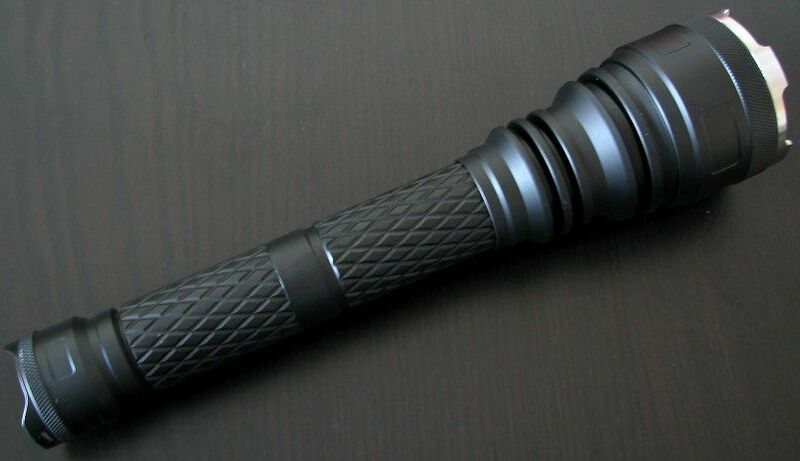 This is the latest revision of the popular Thrunite Catapult line, sporting the new Cree XM-L emitter. 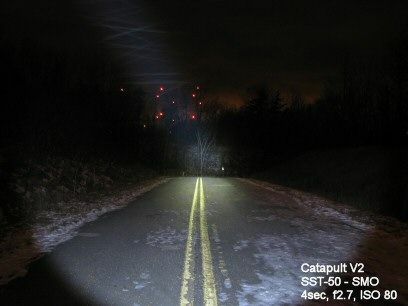 The light is still designated as “V2”, likely because it shares the exact same build and circuit as the “2nd generation” SST-50-based Catapult V2. When using the included extender tube for either 2 x 18650 or 2 x 17670 configuration, insert the extender between the head and the battery tube. The extender may not make contact when installed between the tailcap and battery tube. Voltage cut-off occurs at 2.7V to protect rechargeable batteries. It will flash at 5.2V to indicate low battery voltage for two Rechargeable batteries. Packaging is similar to the earlier Catapult lights (i.e. simple carboard case with cut-out foam). As before, inside you will find the light, extension body tube, warranty card, wrist lanyard, spare o-rings and extra tailcap clicky switch and GITD boot cover. 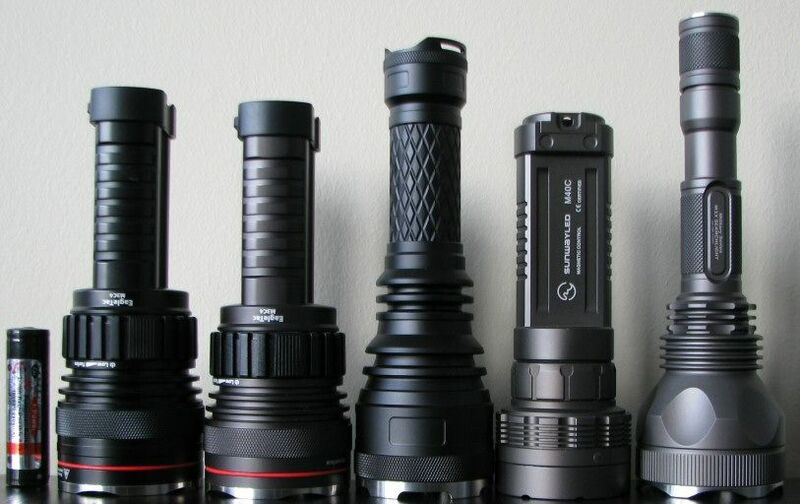 From left to right: AW Protected 18650, Thrunite Catapult V2 XM-L, Catapult V2 SST-50, Olight M31, JetBeam M1X V2. 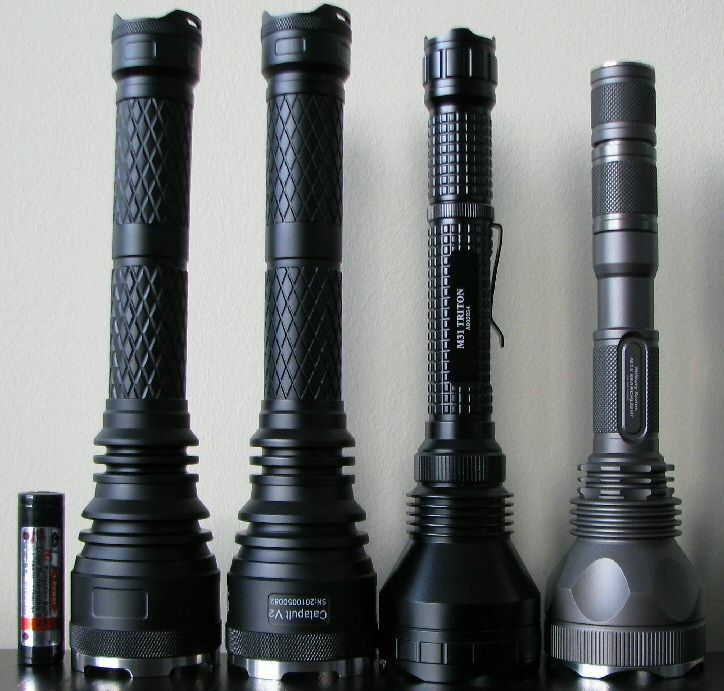 From left to right: AW Protected 18650, M3C4 XM-L, M3C4 SST-50 (OP), Thrunite Catapult V2 XM-L, Sunwayman M40C, JetBeam M1X V2. 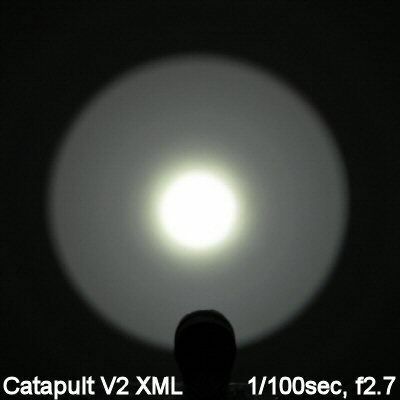 Catapult V2 XM-L: Weight: 438.2g, Length: 255mm, Width (bezel) 58.1mm, Width (tailcap) 35.0mm. Catapult V2 SST-50: Weight: 446.4g, Length: 254mm, Width (bezel) 58.0mm, Width (tailcap) 35.0mm. 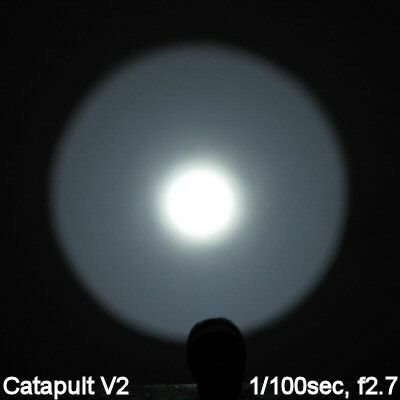 Catapult V1 SST-50: Weight: 410.5g, Length: 250mm, Width (bezel) 59.0mm, Width (tailcap) 34.4mm. As you can see, the XM-L version hasn’t changed in external appearance from the V2 SST-50. It seems to be much the same build. Inside, not much has changed either. The overall dimensions, design, extension tube, screw threads and checkered pattern of the handle/battery tube and tailcap remain the same. These parts are interchangeable between the various versions. The stainless bezel ring and black o-rings are common among the V2 models. 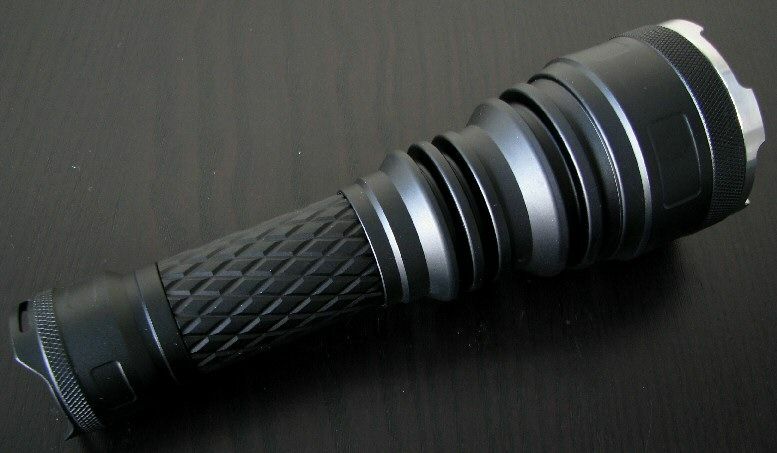 Grip remains excellent – the Catapult has some of deepest-cut checkered patterning that I’ve ever seen on the surface of a light. Body walls remain extraordinarily thick – you could probably run over this with a tank without damaging the batteries. 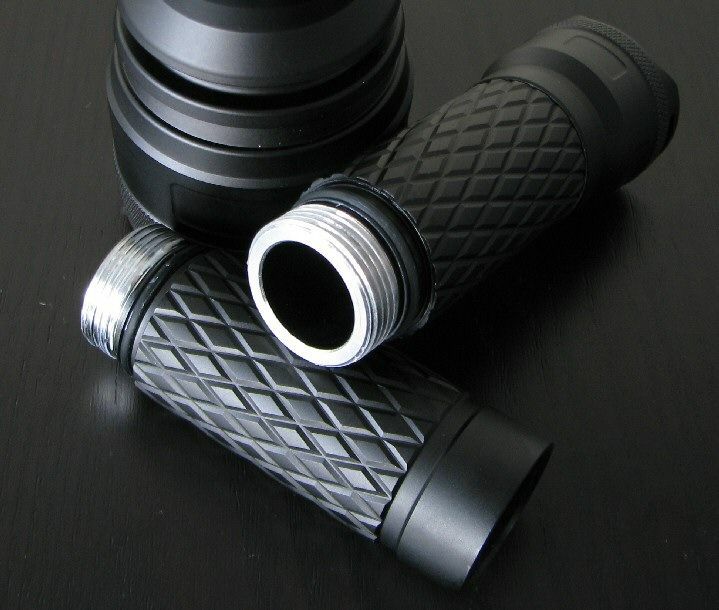 Anodizing (type III = HA) is comparable between the versions. Curiously, my XM-L version lacks any lettering, but I suspect that’s just because it is a review sample. 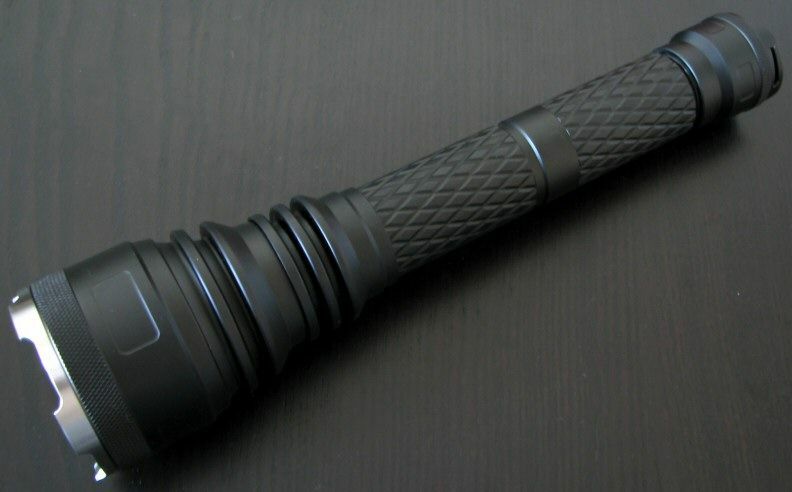 The light can tailstand as before (the raised ridges also serve as attachment points for the wrist lanyard). The switch has the same feel as before, and is fairly typical for standard forward clicky switch. As with the V2 SST-50 version, there is a battery contact cap (with a spring underneath) in the tailcap, and a gold-plated spring mounted on the positive contact board in the head. Newer high-capacity flat-top 18650 cells still work fine. 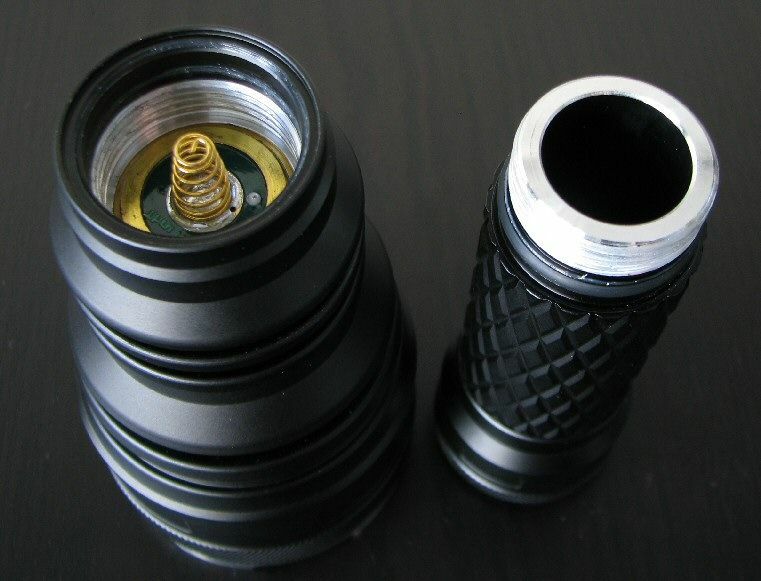 Screw threads in the tailcap and on the corresponding battery tube remain anodized, allowing for lock-out. FYI, as before, the extender portion battery tube goes between the head and the main body tube, not between the main body tube and the tailcap (as is the case on most other lights). It’s important you don’t try to install it the wrong way, or it will interfere with battery contact (i.e. the anodized screw threads will be in the wrong place). The V2 XM-L version is on the left, the V2 SST-50 is on the right. Which brings me to the white-wall beamshots. All lights are on 2xAW protected 18650, about ~0.75 meter from a white wall (with the camera ~1.25 meters back from the wall). Automatic white balance on the camera, to minimize tint differences. Note: The "Catapult V2" refers to the SST-50 version. The new XM-L version is so-labeled in the pics below. The Catapult V2 XM-L definitely has impressive throw! Until the much-larger reflector in M31 came out, the Catapult V2 SST-50 was the throw-king in the SST-50 class. The new V2 XM-L definitely out-throws it significantly – which is not surprising, given the smaller die size of the XM-L (i.e. easier to focus to a point). The overall output seems to have gone up considerably as well. Scroll down for more detailed output/runtime comparisons. Tint on my XM-L sample seems slightly on the warm (yellow-green) side of Cool White. My V2 SST-50 was definitely on the cooler side of Cool White (i.e. bluish tint). The new V2 XM-L definitely out-throws the earlier V2 SST-50. 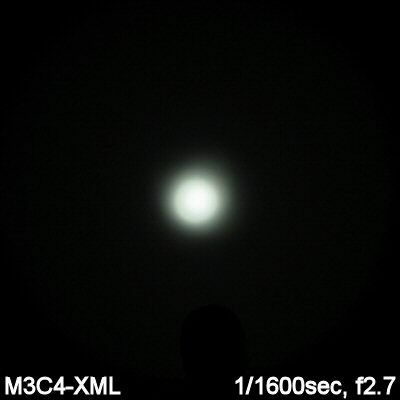 It also seems to have a slight throw edge over the larger M31 SST-50 and M3C4 XM-L. The UI is unchanged from the V2 SST-50 version – twist the head tight for Hi, loosen slightly for Lo. Turn on/off by the forward clicky switch (press-on for momentary, click-on for stay on). There is no strobe mode. 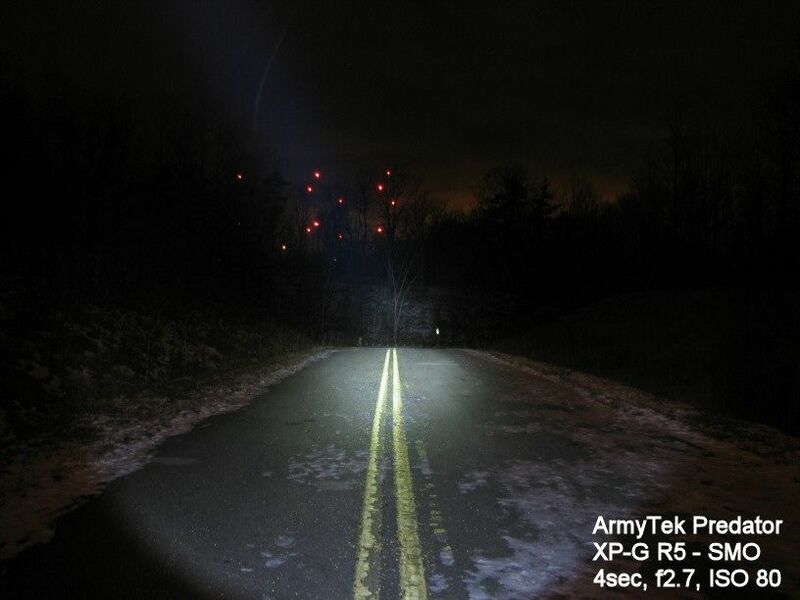 As before (on the V2 SST-50), you can run the light in 2x18650, 4xCR123A or 2xCR123A/RCR configurations. But 2xCR123A/RCR should only be run on Lo, due to the excessively high current demands of Hi (i.e. Hi would exceed the safe discharge rate of 2xCR123A/RCR). 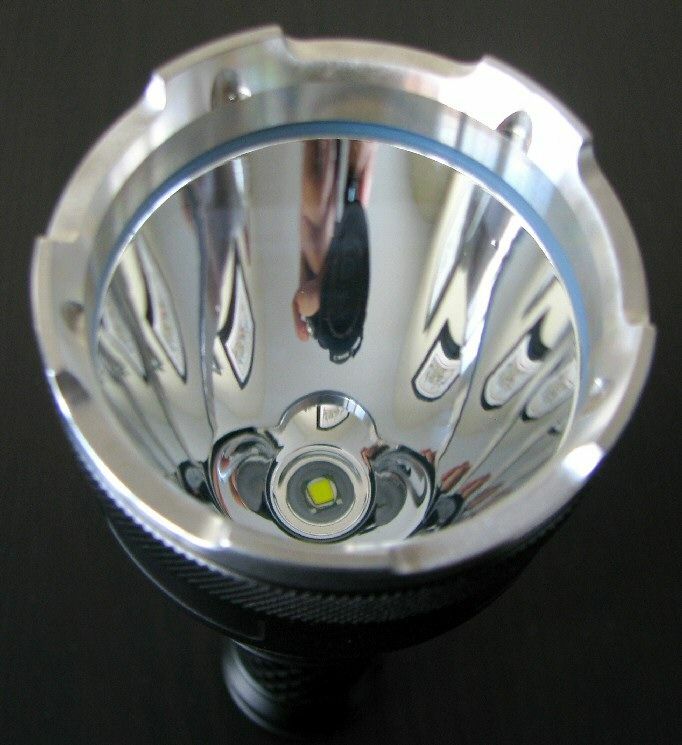 The light also has a thermal sensor, and will cut-out if the temperature exceeds 120C. A good safety feature, especially when running 4xCR123A on Hi. The internal resistance of those cells can result in a lot more heat being generated when placed under a high load. There is no sign of pulse width modulation (PWM) on the Lo mode - I believe that the light is current controlled, as before. There is no strobe mode. All my output numbers are relative for my home-made light box setup, a la Quickbeam's flashlightreviews.com method. You can directly compare all my relative output values from different reviews - i.e. an output value of "10" in one graph is the same as "10" in another. All runtimes are done under a cooling fan, except for any extended run Lo/Min modes (i.e. >12 hours) which are done without cooling. I have recently devised a method for converting my lightbox relative output values (ROV) to estimated Lumens. See my How to convert Selfbuilt's Lighbox values to Lumens thread for more info. Effective November 2010, I have revised my summary tables to match with the current ANSI FL-1 standard for flashlight testing. Please see http://www.sliderule.ca/FL1.htm for a description of the terms used in these tables. The Catapult V2 SST-50 throw-king is dead, long-live the new Catapult V2 XM-L throw-king! The new XM-L version has considerably more throw than the earlier SST-50 (consistent with the smaller die size of the XM-L). Output has also increased considerably. Note: Effective January 2010, all CR123A runtimes are now performed on Titanium Innovations batteries. You can compare the performance of these CR123A cells relative to the Duracell/Surefire cells used in my earlier reviews here. 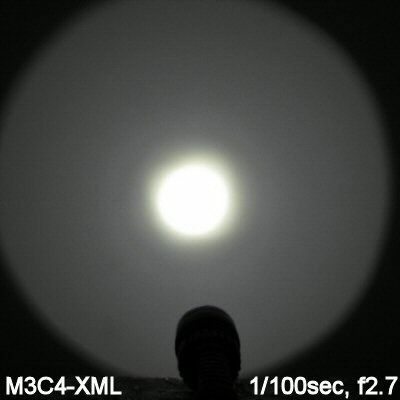 The new XM-L lights certainly have an advantage over the earlier SST-50 and MC-E-based lights in terms of overall output and runtime efficiency. My V2 XM-L was able to run continuously on 4xCR123A on Hi without the thermal cut-off kicking in (as shown on my V2 SST-50). Nevertheless, I recommend you be careful and limit yourself to brief periods on Hi when running on 4xCR123A. As with many lights of this class, the light is heavily driven on Hi - so I recommend you run it in 2x18650 configuration in this mode. 4xCR123A is acceptable on Hi, but thermal cut-off may occur if the batteries/light get too hot. 2xRCR/CR123A should only be used on Lo, due to excessive discharge rates on Hi. The light has only two modes, and lacks a true low or any sort of the strobe/beacon. Make sure you insert the extender battery tube between the head and primary tube (otherwise, the light will probably not light up). The Catapults are heavier than most lights of this class, and no holster is provided. The only real difference between this new XM-L edition and the previous Catapult V2 (SST-50) is the emitter. 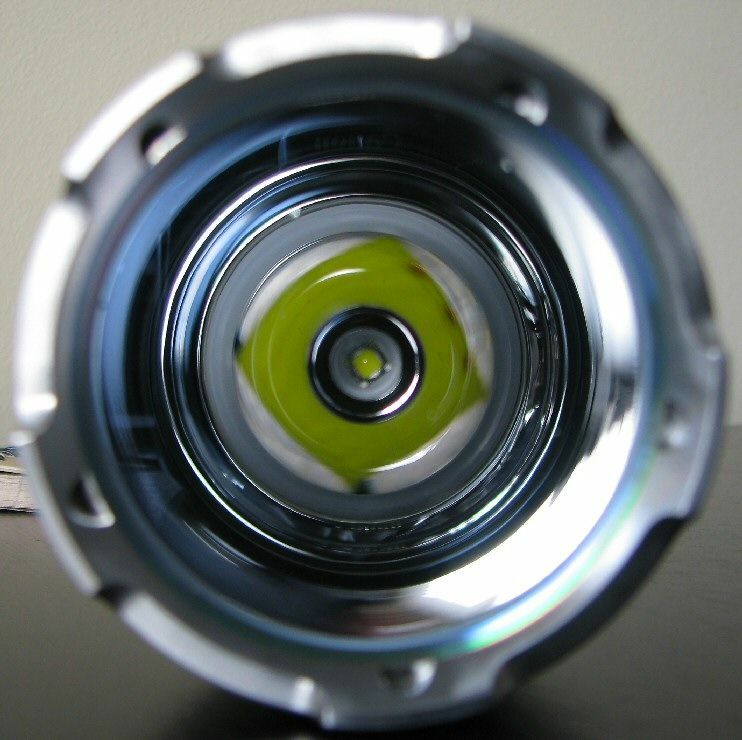 Everything else about the light – from its robust build to circuit design - remains the same. So how significant is this emitter upgrade? To put in a nut-shell: you get ~30% more output (estimated lumens) and throw (as measured by beam distance). 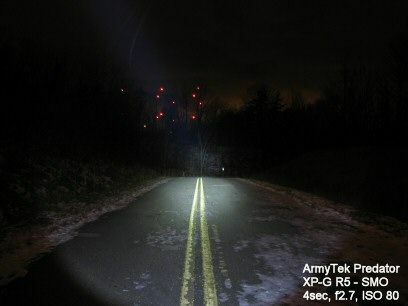 That is significant when you consider that the original SST-50-based V2 was the class leader for throw before the release of the larger-reflectored Olight M31. The XM-L also seems to be more efficient at the lower output level. As an aside, don’t get fooled by raw lux at 1m values (i.e. 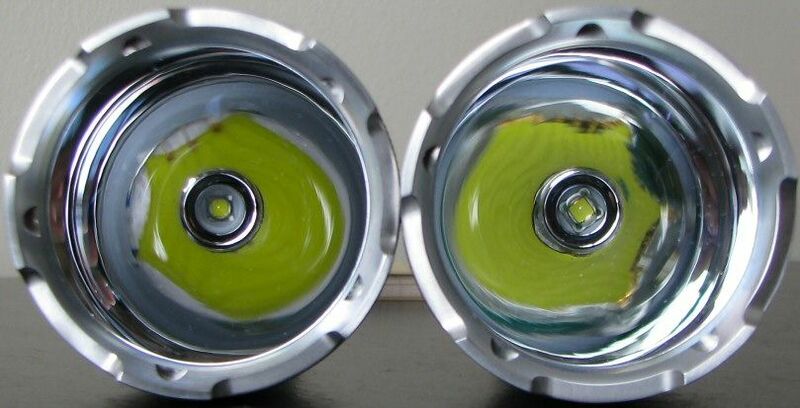 46,000 lux for the XM-L vs 26,500 lux for SST-50). Center-beam lux is a non-linear scale (i.e. drops with distance according to an inverse square law). Beam distance is the appropriate measure to compare the “throw” of lights (i.e. 429m vs 326m). 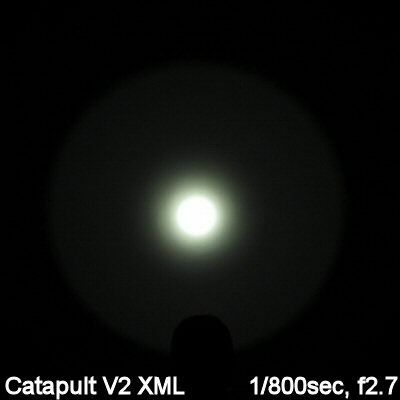 For the time being, the Catapult V2 XM-L retakes the crown as the furthest throwing 2x18650 light in my collection. Please see my earlier Catapult V2 SST-50 review for a discussion of the build. It certainly has the advantage of stable and mature platform. It is as solid as a tank, with a substantial feel and good grip. 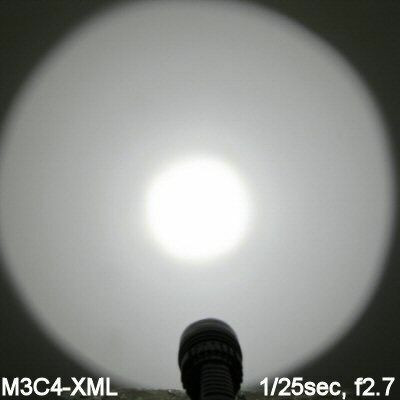 The flexibility of 4xCR123A/2x18650 is also good, and the light can even run on 2xCR123A/RCR (on Lo only, due to the high current drain on Hi). At the end of the day, the Catapult still has all the characteristics that made it a leader in the SST-50-class – excellent output, superb throw, and remarkably smooth beam and hotspot. But the Cree XM-L upgrade has turned a good light into an even better one. Catapult V2 XM-L provided by Thrunite for review. Last edited by selfbuilt; 03-12-2011 at 08:55 AM. I was unable to find cache data for p1, so this post is a placeholder should I find it at some later point. Just my personal opinion. Obviously we all value different things in a light! I like reading why others prefer one over the other, IMO it compliments these well done reviews nicely. Thank you for the comparison it was very enlightening. I chose the Thank you for the comparison it was very enlightening. I chose the Catapult XM-L for its simplicity and fewer moving parts. Plus it throws a little better. 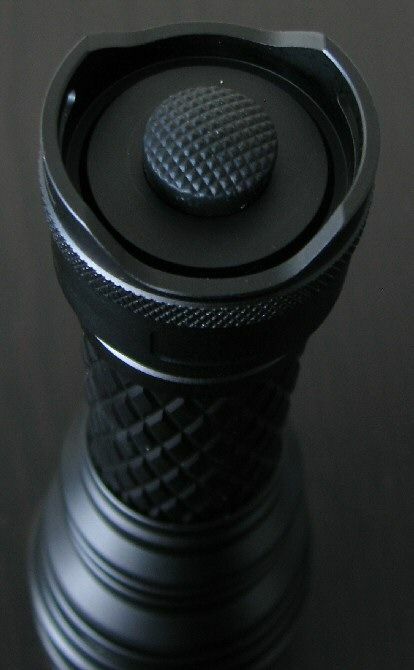 I would love to have 3 modes : max, 300 lumens, 100 lumens... Or max and 300. I'll tell you more when I'll receive it, I can't wait ! 1) Low mode needs to be lower - I don't find too much advantage between the low mode it has (which is really bright) and turbo mode. I'd rather the low mode was further down to accomodate close range work. 2) With the battery extender there are 4 threaded sections to this light. The tailcap, the extender, the threads for the regular battery tube, and then the threads to the head. For me, this makes having a loosen/tighten to switch modes usage model a little annoying. Sometimes I was loosening the wrong threads. I had to be sure to grab the light just right between both hands. I think that's ultimately my biggest annoyance. If you have both hands free.... it's fine. But I was finding that the moment I wanted to change modes I always had something in my other hand! So a different method of changing modes would be better for me. Maybe a second button like some of the Fenix's that you pushed to change brightness. Those 2 changes and I might have given the nod to the Catapult! Brilliantreview. I am going to start my collection soon and after reading this review, it is mostly likely going to be with this one. Sometimes I was loosening the wrong threads. I had to be sure to grab the light just right between both hands. I think that's ultimately my biggest annoyance. Initially, I had this issue. To solve it, I put some special flashlight lube on the O ring and threads to the head. This extra lubrication made it very easy to switch modes without loosening any other parts of the flashlight by accident. Initially, I had this issue. To solve it, I put some special flashlight lube on the O ring and threads to the head. This extra lubrication made it very easy to switch modes without loosening any other parts of the flashlight by accident. A moonlight mode would be a nice addition but for that I carry a smaller light. 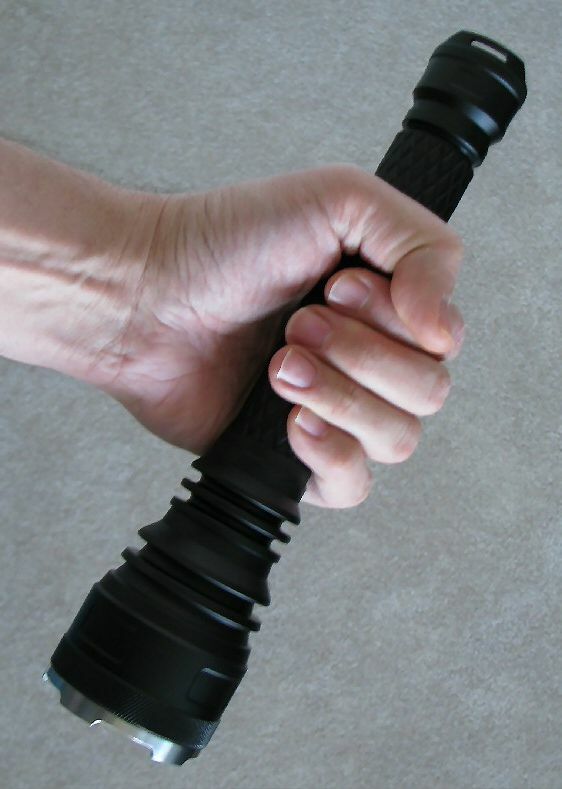 I need the laser like throw since I walk in pitch black darkness with Black Bears around. The throw is indeed laser like! A touch narrower then the M3C4 which is what gives it a few extra feet of throw per selfbuilt'sreview. You really can't go wrong with either of these lights! I'd recommend both of them to anyone. the one thing i had to get used to when switching from low to high, etc, was you have to give it a good twist to really loosen it up a little, otherwise if you rocked the tube and the head it went from low to high and back from the slight movement of the tube. i gave it a nice full turn to go to low mode and it works perfect and stays on low. i like how bright the low mode is. If i needed a real low mode i would use another light as this light is too big to use for low light stuff. My ITP-e50 is perfect since it's 0-230 lumen adjustable. they make a perfect team.. Thank you for the comparison it was very enlightening. 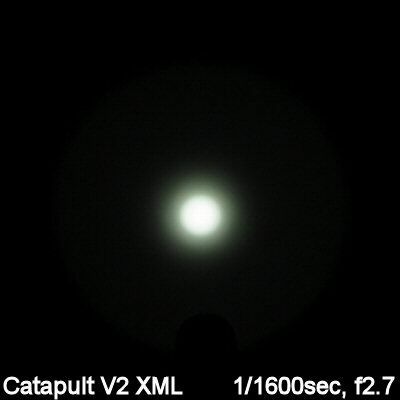 I chose the Catapult XM-L for its simplicity and fewer moving parts. Plus it throws a little better. Same here, it is by far my best thrower. But the beam is also very useful, its tight, but not so tight its like a laser pointer. I have an R2 that seems too tight. I would recommend the cat to anyone.. Same here, it is by far my best thrower. But the beam is also very useful, its tight, but not so tight its like a laser pointer. I have an R2 that seems too tight. I would recommend the cat to anyone..
Hi all, I received myCatapult V2 XM-L today. It is very well built and solid as a tank. The beam pattern is perfect : a bright hot spot with bright and usefull corona around it and a less bright but still usefull spill. Thrunite has stated it is normal for the center of the hotspot to be a bit darker then the outer part. I believe this was over in their forum section on cpf marketplace where they said this. Thank you for your answer infinus, I'll check this thread. Also why some doesn't report a darker hotspot ? Likely because it can be quite variable (e.g. same issue as XP-Gs and smooth reflectors?). Can't say I noticed anything on my one sample - but it is just one sample. Likely because it can be quite variable (e.g. same issue as XP-Gs and smooth reflectors?). Can't say I noticed anything on my one sample - but it is just one sample. Those are consistent with the slightly longer runtime on the Cat2. But as always, I recommend you rely on the actual runtimes for more info. Likely because it can be quite variable (e.g. same issue as XP-Gs and smooth reflectors?). Can't say I noticed anything on my one sample - but it is just one sample. Do you think it has something to do with the LED positon within the reflector ? Or perhaps I was thinking it could have something to do with the silicon dome wich may not have the same shape for each sample and so include variation on the beam pattern ? Do you think it has something to do with the LED positon within the reflector ? Or perhaps I was thinking it could have something to do with the silicon dome wich may not have the same shape for each sample and so include variation on the beam pattern ? Do you think it has something to do with the LED positon within the reflector ? Or perhaps I was thinking it could have something to do with the silicon dome wich may not have the same shape for each sample and so include variation on the beam pattern ? I would think more likely the first point. 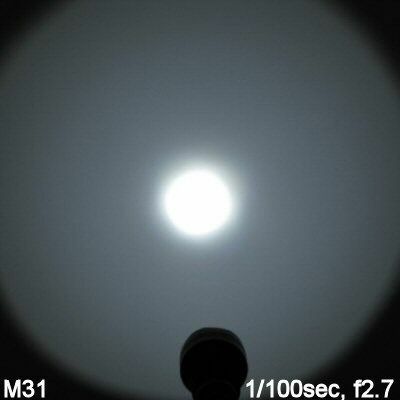 The QC at the time of manufacture should be quite good - it's likely some interaction with the reflector. You could try loosening the bezel, to see if that helps. I would think more likely the first point. The QC at the time of manufacture should be quite good - it's likely some interaction with the reflector. You could try loosening the bezel, to see if that helps. I would think more likely the first point. 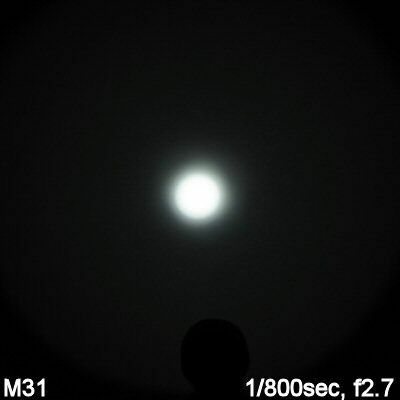 The QC at the time of manufacture should be quite good - it's likely some interaction with the reflector. You could try loosening the bezel, to see if that helps. I plan to use this light daily - about 1 hour per day - and realized there is a maintenance component. As I understand it, part of the lights circuit is the battery tube. When you tighten the head you create the high output circuit. When you loosen the head, you create the low output circuit. 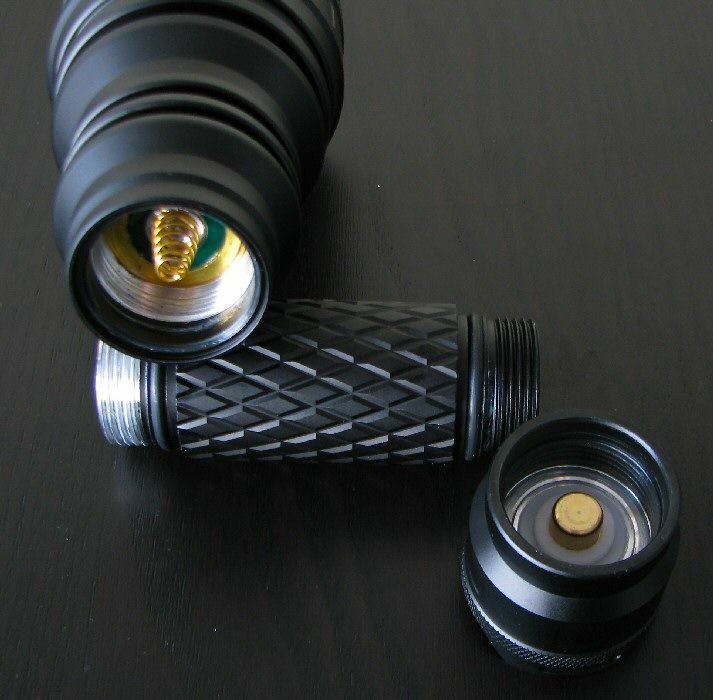 If that is correct, the threads of the body tube that connect to the flashlight head maintain the low power circuit and the inner body tube that connects to the head create the high output circuit. So, how do you lubricate these connections so that they move smoothly yet conduct electricity? Also, as the threads wear down from use will this wear have an affect on the circuit? myxm-l also had the darkness inside of the hotspot. i solved that by loosening the head just enough to eliminate it and adding an oring to fill in the gap so that there is no rattle or loseness. also i just got lucky with the thickness of the oring that i had in my toolbox, so now the hotspot is larger and no darkness just a bright hotspot. it reminds me of the vr1 sst50 cat. i like it alot more now than with the dark spot in it. if all xm-l emitters have this flaw, i will steer clear of them. theres just too many other emitters that are great and have a wonderful beam. i had the vr1 cat but sold it last year and ive regretted it ever since. I haven't experienced the dark spot with myV2 XM-L. Perhaps I'm just lucky, but we would have to get many more reports before we can decide whether this is a general problem or just a couple of flukes. my xm-l also had the darkness inside of the hotspot. i solved that by loosening the head just enough to eliminate it and adding an oring to fill in the gap so that there is no rattle or loseness. also i just got lucky with the thickness of the oring that i had in my toolbox, so now the hotspot is larger and no darkness just a bright hotspot. it reminds me of the vr1 sst50 cat. i like it alot more now than with the dark spot in it. if all xm-l emitters have this flaw, i will steer clear of them. theres just too many other emitters that are great and have a wonderful beam. i had the vr1 cat but sold it last year and ive regretted it ever since. When you loosened the head to focus the beam didn't it drop to low mode? If not why not? When you loosened the head to focus the beam didn't it drop to low mode? If not why not? If the Cat2 had an extension allowing 2 X 18500 I'd be in. Apparently it does not. When you loosened the head to focus the beam didn't it drop to low mode? If not why not? the head has two sections, one section is the hi and low adjustment(where the ext tube attaches) and one (upper) will remove head from the body. the upper one is the one that you can adjust the hotspot with, thats where i put the oring, it has no effect on the hi low adjustment. just make sure to really snug it down so when your turning it to hi or low, it is tighter and will stay snugged up. the head has two sections, one section is the hi and low adjustment(where the ext tube attaches) and one (upper) will remove head from the body. the upper one is the one that you can adjust the hotspot with, thats where i put the oring, it has no effect on the hi low adjustment. just make sure to really snug it down so when your turning it to hi or low, it is tighter and will stay snugged up. Speaking of high and low mode, when I unscrew the lower part of the head for low mode, I've got sometimes the flashlight to switch off momentarily. As if the contact where not good, it's difficult to be in a stable low mode : once it goes on high once it goes on off ! I had to untighten mine at least a full turn to avoid that. Something similar can happen if the extender piece is inserted in the wrong place (i.e. between the tailcap and the standard battery tube). If it isn't located between the head and standard battery tube, intermittent contact can occur when the head is loosened. Something similar can happen if the extender piece is inserted in the wrong place (i.e. between the tailcap and the standard battery tube). If it isn't located between the head and standard battery tube, intermittent contact can occur when the head is loosened. Are your throw numbers estimates/calculations or do you have a way of actually measuring total throw distance? I ask because yesterday I had both my Catapult and M3C4 out to compare their performace at very long distances. Previously I had only compared at distances of 100 feet or so. At 100 feet I felt the Catapult throw was better due to it's more concentrated hot spot. When I had both flashlights out at much longer distances however I no longer believe this. 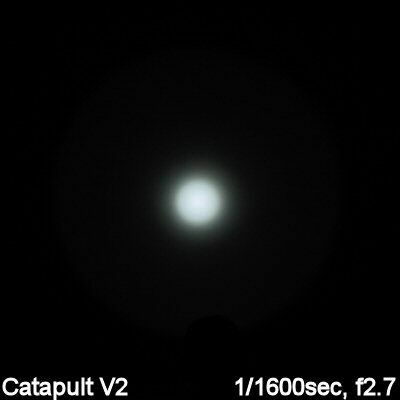 The slight donut affect on my Catapult was more magnified as the hot spot got more dispersed and total throw at long distance I felt went more in favor of the M3C4. This isn't white wall hunting. At great distance, against trees, buildings, etc, I could more visibily notice the donut hole affect on the Catapult. I really felt like this became a limitation on throw at long distance and that the M3C4 was indeed out throwing the Catapult. So I wanted to ask if you had the capability of actually measuring throw at long distance (or do you already?) or if you calculate it based off of your lightbox numbers? 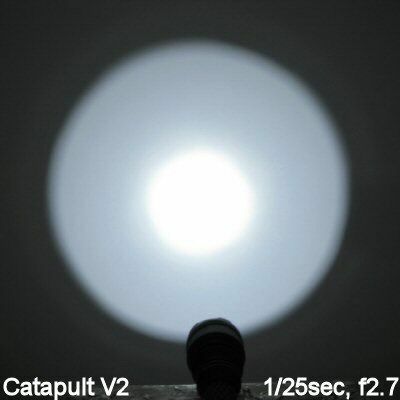 I'm starting to think the donut hole on the Catapult (which is much less an issue at closer distances) is really taking away from total throw on this light at longer distances. You need to calculate throw, it is impossible (and impractical) to just aim the light out in the landscape and the measure how far it throws. One of the problems is getting a dark enough location, another problem is who is used to decide if the landscape is visible or not? (Not everybody sees the same in low light). 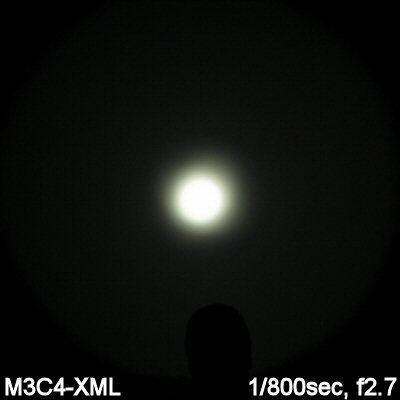 The usual method is to measure lux at some distance and then calculate at what distance the brightness is down to 1 lux or according to ANSI/FL1 0.25 lux. My throw numbers are done according to My throw numbers are done according to ANSI standards. A lux reading in the brightest portion of the beam is taken at 5 m (to allow the beam to fully converge), and then computed back to give you the lux value at 1 m. All readings taken after 30 secs runtime. Beam Distance (to 0.25m) is then a computed value of the distance (in meters) at which the flashlight would produce a light intensity of 0.25 lux at its brightest point. So, it really reflects what the hotspot looks like at 5m. If there were a pronounced donut at that point, you really should take the reading at the brighter peripheral areas. But in my case, there is no noticeable donut on any of the XM-L lights, so 5m reading is really pretty much from the centre. I haven't tested the lights further than 100-yards (as shown in my I haven't tested the lights further than 100-yards (as shown in my 100-yard beamshot thread). At that distance, the Cat-XML seems to have a brighter hotspot than my M3C4-XML. But if you had a slight donut effect, I could see the difference as being neglible at this distance (or further out). 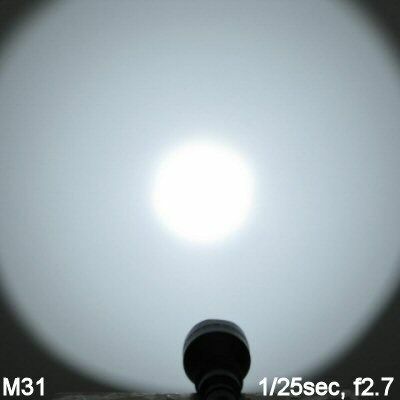 The M3C4 could also potentially have an advantage - again, it depends on how bad the donut is on each light. EDIT: I see you've quoted HKJ's response, which I fully agree with. Landscape pics and personal impressions are both highly subjective, and it is simply not practical to try and directly measure throw at very great distances (i.e. a lux meter and pair of binoculars? ). Ambient lighting is definitely an issue (e.g. I had the moon pass in and out of clouds on my recent 100-yard beamshots, and could note the effect). Plus we are only talking n=1 experiments here - the range of focusing from one sample to another of the same light can vary greatly. @selfbuilt: Sir, first-rate review. Thank you very much! I've been out of lighting and off CPF for quite a few years. I come back looking for a thrower, I find this review...now I know what to buy. Thanks again! For people that own this and a SF M6 how do the two compare in throw using the MN21 in the M6? Excellent review! Kudos to the OP for doing sharing this. Now I want the Catapult V2! I wish I hadn't sold my M6/MN21 because I too would like an answer to this question. At the time I sold the M6 there was no LED light that could come close to equalling it. I wish I hadn't sold my M6/MN21 because I too would like an answer to this question. At the time I sold the M6 there was no LED light that could come close to equalling it. some folks seem to be having. I ordered my first V2 XM-L from Lightjunction and then ordered a second from Going Gear when I heard they were adding a strobe mode. No strobes for me. It is like having two different lights. The sample from Going Gear says "Asia version" in one of the four depressions around the head of the light. The hotspot is half the size of the Lightjunction version even though the reflectors look identical. Tailcap current readings were higher on the Going Gear reading just over 1.7A with fresh batteries while the one from Lightjunction measured just over 1.6A. Going by the serial numbers the Lightjunction is a newer light. Anybody else have one that states "Asia version" on the head? Note: Do not use CR123 or RCR123A / 16340 batteries in the Catapult! When using the included extender tube for either 2 x 18650 or 2 x 17670 configuration, insert the extender between the head and the battery tube. The extender may not make contact when installed between the tailcap and battery tube. All the sites I have seen list 4 x CR123 as an acceptable configuration. Can anyone clear this up for me? I think that's just a cut-and-paste issue from the earlier description of the original V1 Catapult (which didn't take 4X battery sources). Ever since the V2 SST-50 version, the Catapult can take 4xCR123A. I think that's just a cut-and-paste issue from the earlier description of the original V1 Catapult (which didn't take 4X battery sources). Ever since the V2 SST-50 version, the Catapult can take 4xCR123A. FYI, I am currently working on a review of the next model V3 Catapult (also XM-L). Should be done in about a week's time. Great! Can you give any hints as to the specs of V3? Been trying to find it but no one seems to know. Nice review! 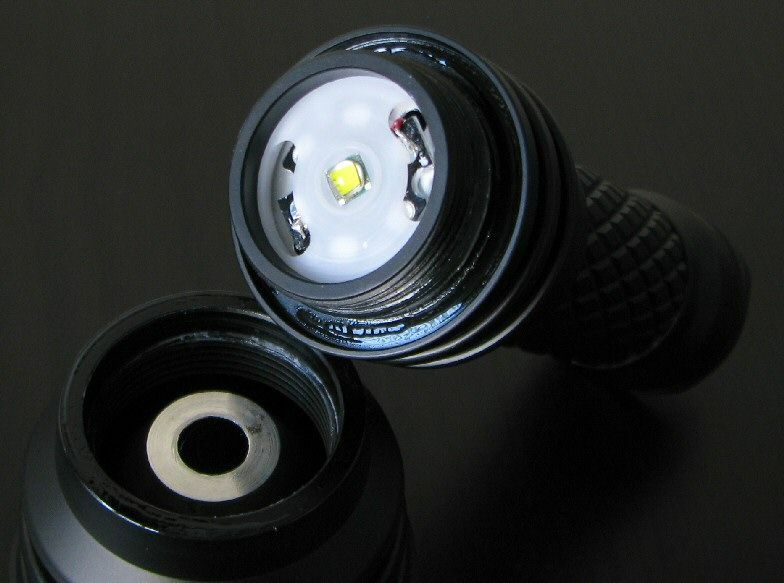 Thrunite Catapult V2 Cree XM-L sounds like it's one of the big boys on the block. I actually like the V2 with only low and high. I can't stand going threw all the other options strobe etc. This was my first Thrunite and eventho the reviews I was abit sceptical about the built quality, but i can't really find one thing that isn't fitting perfect or feels weak. It's heavy, the threads came lubed and it all feels so durable. Ironically today I also found out my SF LX2 has a small defect, part of the seal between the lens and bezel seem to be missing, only 3-4 mm tops, but still not something i would expect from SF, but I'm sure it will get solved. Hope to hear from the shop i bought it from soon. 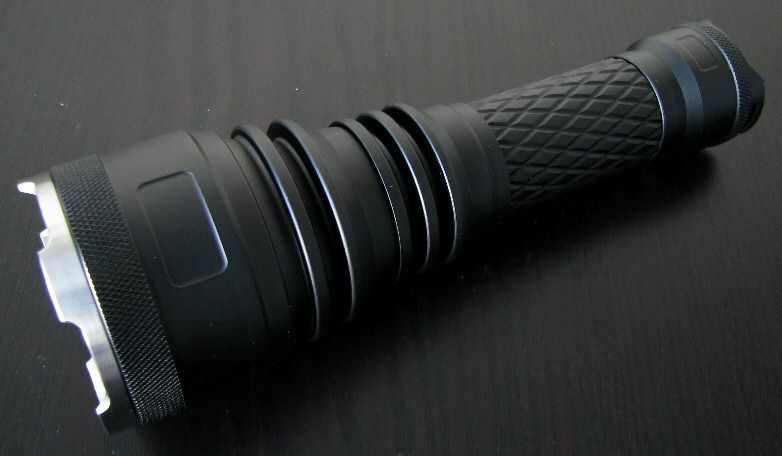 Anyway the V2 xm-l is alot of good durable flashlight for a good price imo. The main review post has been updated with the final review text. P.S. 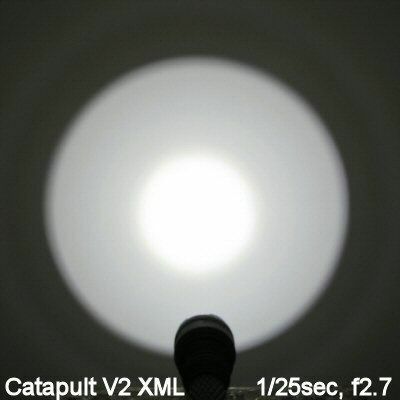 : I'm working on a Catapult V3 XM-L review, should be up soon after I finish all the thread reconstructions. What is the best 18650 for this light? Will the newer 2900mah fit and function OK or should I stick with a standard 2200mah? Why can't I subscribe to this thread? 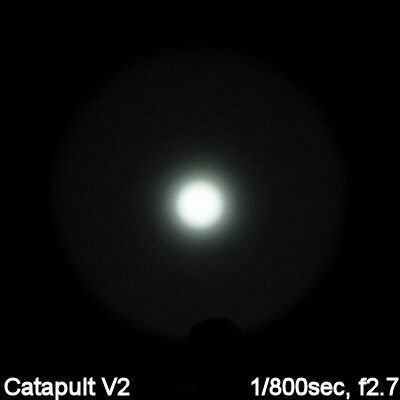 My 2900mAh Redilast (and various 2600mAh cell)s all worked fine in both the V2 Catapult, and newer V3 version. Great! Any idea if the larger 2900mah will have problems fitting in my UltraFire WF-139 charger? As usual, selfbuilt, an excellent review! Lots to read & see, which I love! 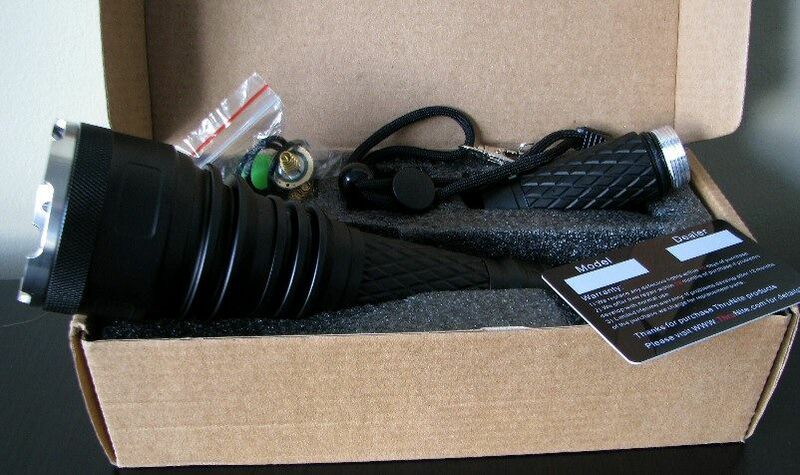 I just bought a V2 with an SST-50 LED for $110 shipped, which I've been waiting to find for the right price. I know the XM-L is a little brighter, esp. on paper, but I don't like the "yellowish" tint it has compared to the SST-50. Not enough of a throw difference visually to make me buy one, as I prefer neutral tints. I also have a TD15 set up with 2x18650s (2 extenders, RP-G R5) that the V2 just blows away! For my purposes & from what I can see, the SST-50 fits me much better. To each his own? Just ordered an Armytek Predator G109.1 based on selfbuilt's review & videos I have seen. Will post on that one when I get it. Was thinking it would be about the size of the TD15 with 1 18650 running? I, also, was wondering about using higher mAh 18650s in my UF-139 charger & what advantage they would have compared to my usual JB 2300 mAh ones. Another one wondering about this? I have to down-load the manual for the UF-139, as none is supplied in the box. Might help?? Again, excellent review & as always, love to see beam-shots! For the charger, you should probably check in with the experts in the "Flashlight Electronics - Batteries included" subforum. But as a general rule, any charger for 3.7V Li-ions can handle the the higher capacity cells (i.e. they all need to terminate by 4.2V). The main difference is the higher capacity cells will (typically) run longer for the same output level. However, there can be differences in how they respond to different loads (especially heavier ones), so I suggest you check in with the battery experts in that subforum for more info. im quite interested in what you have to think about the predator's throw compared to your catapult SST-50. I have a catapult v1 with neutral tint SST-50 and have been wanting to pick up a predator for while now. i know the lights are in completely different class' but would be interesting to see how they compare. As you say, hard to compare such different classes of lights. So, I think I will let the pictures do the talking - from my 100-yard outdoor round-up, here are the Carapult V2 SST-50 (cool white) and ArmyTek Predator, both taken at the same time. I recommend you open the high-resolution images in two different tabs, so you can switch back and forth to directly compare beam profiles. Thanks for the battery info selfbuilt. Personally, I love my V2 with the SST-50. Does just what I want & only 2 modes. Seems Armytek has taken all that many have said here & are coming out with a new Predator on 5/20. 10 degree reflector for more flood, plus a black matte bezel option. Also, 2 more firefly modes added. Told them I wanted the original with more throw. Is taking a while, as I ordered on 5/10 & still not shipped. Last edited by DLite57; 05-14-2011 at 06:26 PM. Reason: Forgot spec to add. Still waiting for my Predator. Just cleared Chinese customs & given to shipper. Also ordered a Xeno G42 today, so will compare my V2 with them when they come. All are cool tint, so close in color. Man, the depth of the reflector in the Xeno is DEEP! The XP-G is placed about 1/3rd of the total length from the end of the head (try & picture this!). Weight w/o battery is 255gms., so made to take a beating. This one might out-throw the Predator! Will have to wait & see. Might be time to get a tripod & do some righteous beam-shots that match well? Will have to start a new thread comparing my JB JET-III PRO Ultra, TD15 with-w/o extenders, the V2 SST-50, the Predator & the Xeno G42. I'm curious how close & different they will be. Think the V2 will out-throw the rest, but then what? Won't even put my JB BC40 in, as it's not a thrower (floody! ), but a nice light for what I paid. Got my Xeno G42 in 2 days! This is an amazing thrower, keeping up with my V2 SST-50 @ 200 yds.! Predator is still in shipping mode, so will have to wait to do a comparison. The Xeno KILLS my TD15! Not even close! Will include my V2 in my XP-G thrower thread. selfbuilt, can't ever come close to yours, but I'll do my best with info.